Starting the post-sale relationship off right is key to customer retention. While this can’t be emphasized enough, with regards to onboarding, be careful not to mistake giving customers more choices and information for a better process. Chances are that your sales team pulled out all the stops to attract the attention of your current customers. Customers are drawn to large numbers of features and options when making the initial purchase decision. You would think that after they’ve closed the deal, it’s your job to explain all the details and nuances about everything they were promised in the sales pitch. It’s time to exceed all of their expectations. But when it comes to onboarding it is very easy to overwhelm them with all of those same options that originally attracted them to your product. One of the basic phenomena in behavioral economics is choice overload, which occurs when you present someone with too many choices. It is associated with unhappiness, decision fatigue, going with the default option, and choice deferral. By showing your customers all of the customizable settings, features, and options right at the beginning of your relationship, before they are familiar with you or your product, you run the risk of overwhelming them into inaction and dissatisfaction. With a more complex choice set, a more difficult decision task, more preference uncertainty, or a more prominent and effort-minimizing business goal, there is a greater chance of choice overload. Poor onboarding is one of the leading causes of churn, so overwhelming your customers during onboarding can be one of the most impactful mistakes regarding your overall customer experience. Read more about avoiding cognitive overload using customer-centric design for successful onboarding and retention. Your step-by-step instructions, videos, and one-on-one walkthrough conversations for onboarding will be negatively impacted if the web pages customers interact with are cluttered. If the instructional video/ help documentation is buried in an obscure corner of your homepage, you’ll find that your Success team spends too much time acting as Support. The easiest way to learn if you have a problem is to gather feedback from customers who have completed onboarding. 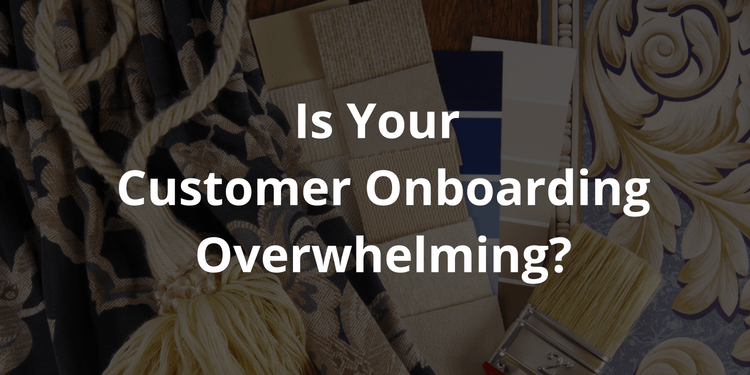 Both types of overload are easily identified when you ask customers “How easy was it for you to complete onboarding?”, the Customer Effort Score question. Asking for a score and comments will bring to light the most prominent issues at this journey point. By gathering feedback immediately after onboarding, customers who struggled with the user interface will be able to provide you specific examples from their experience that need adjustment. For example, you may hear from a customer who is colorblind that the color theme for a specific chart was tough to distinguish for them, or that finding a specific button took more time than they had anticipated. Read more about how Customer Effort Score can improve your onboarding process. Driving adoption and customer loyalty is a tough job, but flooding new customers with information is not the way to go. Gathering feedback throughout your relationship about effort, satisfaction, and loyalty will help you improve the entire customer experience and prevent you from overwhelming your customers at any point in their journey with you. To provide an excellent customer experience, all you need to do is provide convenient information that helps your customers achieve the next milestone, or inspires them to develop a new milestone. By listening and taking action, you build trust and loyalty with your customers that will help you win customers for life.